PowerCor Professional is a two way compact speaker. It is also available as a Powercor Home with lower efficiency. 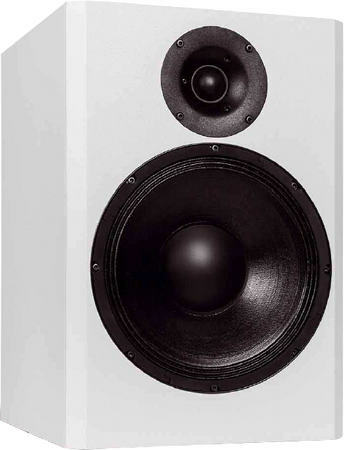 PowerCor Professional is a bass-reflex cabinet loudspeaker with drivers of Wavecor . The loudspeaker has been developed by Thomas Schmidt, Daniel Gattig and Dennis Frank. At low volume, i.e. 85 dB at 1 m, the nonlinear distortions are below 0.3% above 300 Hz and doesn't exceed 0.5% at 95 dB at 1 m between 300 Hz and 10000 Hz. That is quite splendid. The high-end kit is delivered with baked varnish air core coils on important parts of the crossover for minimizing microphonic effects. - The current flow through the coil creates a magnetic field which sets the reel of wire in motion. This motion induces a voltage in the coil which adds itself to the signal. The stiffer the reel of wire is, the less the signal will be altered. The capacitor for the Wavecor TW030WA11 is of type polypropylen (MKP) Clarity-Cap CSA 630 V.